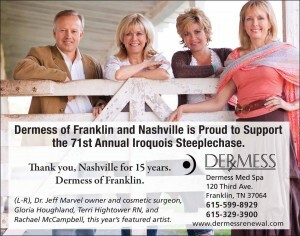 With Dermess of Franklin now up and running, our business has jumped to a new level. Now patients in Williamson County can see one of our Franklin RNs for Botox, injectables and consultation. Without driving into Nashville. It’s a win-win for everyone! And with our enhanced presence, we’re getting more involved with the communities that support us. The 71st Iroquois Steeplechase – benefitting Monroe Carell Jr. Children’s Hospital at Vanderbilt – is just one of the places you’ll be seeing us. 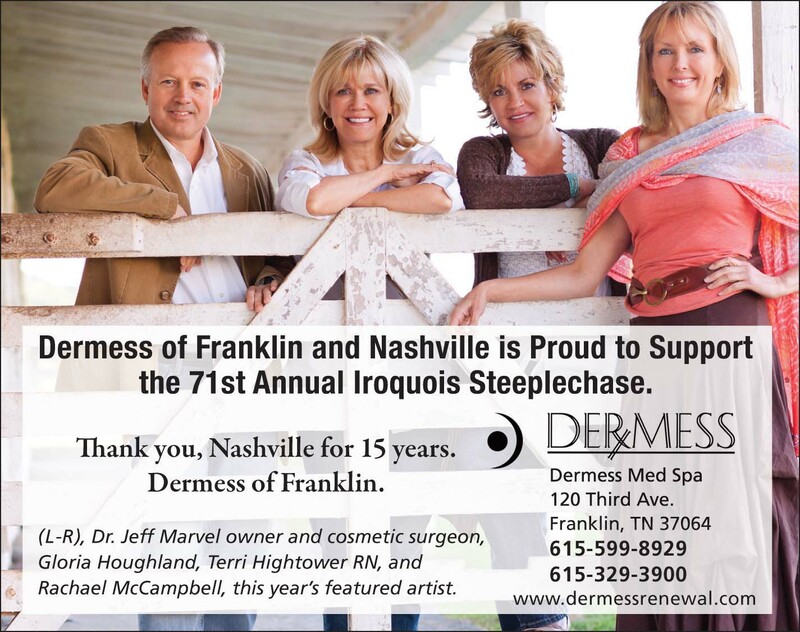 Dr. Marvel, Terri and Gloria share the gate with Rachel McCampbell, this year’s featured Steeplechase artist. Capturing the awe-inspiring beauty and movement of the horse is a difficult feat, but one that McCampbell does seamlessly. And take a look at Gloria! Four months after her facelift and fat transfer procedure, she looks refreshed, glowing and confident. Who cares about age…Gloria proves it’s only a number. We’d like to thank again all the patients who’ve been along with us for this incredible ride. We hope you’re part of our Dermess family for the next 15 years! This entry was posted on Monday, April 30th, 2012 at 11:49 am	and is filed under Uncategorized. You can follow any responses to this entry through the RSS 2.0 feed. Both comments and pings are currently closed. « In Skin Renewal, Don’t Forget Your Hands!